The notion that Europe and other advanced economies are suffering secular stagnation is gaining traction. This column by Larry Summers – first published in the Vox eBook “Secular Stagnation: Facts, Causes and Cures” – explains the idea. It argues that a decline in the full-employment real interest rate coupled with low inflation could indefinitely prevent the attainment of full employment. Just seven years ago all seemed well in the field of macroeconomics. The phrase 'great moderation' captured the reality that business cycle volatility seemed way down from levels of the first part of the post war period. A broad methodological consensus supported the use of DSGE (dynamic stochastic general equilibrium) models to understand macroeconomic fluctuations and to evaluate macroeconomic policies. There was widespread support for the idea that the primary concern of independent central banks should be maintaining appropriate inflation targets and reacting to cyclical developments to minimise the amplitude of fluctuations. Economic crisis has led to crisis in the field of macroeconomics. The idea that depressions were a concept of only historic interest has been belied by the financial crisis and “Great Recession”. 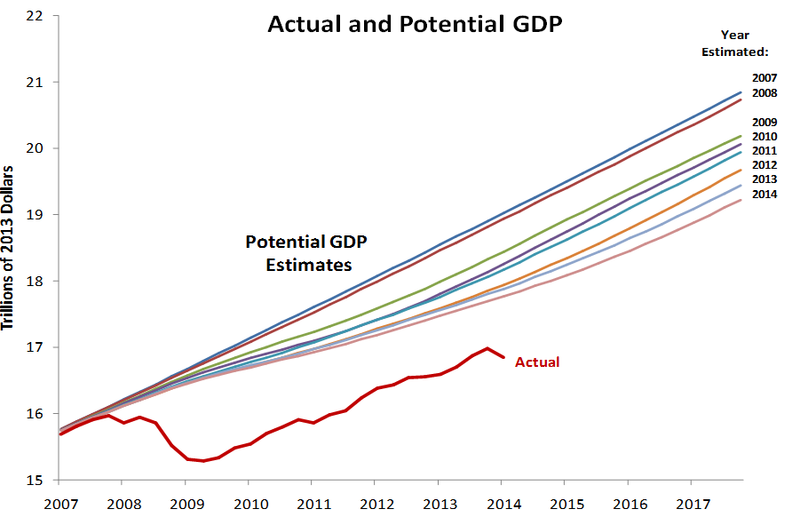 Figures 1a and 1b depicts the gap between actual and potential output estimated as of various dates for both the US and the Eurozone. It is apparent that output is far short of where its potential was expected to be as of 2008. Even more troubling is the observation that most of the gap is expected to represent a permanent loss as potential output has been revised sharply downwards. 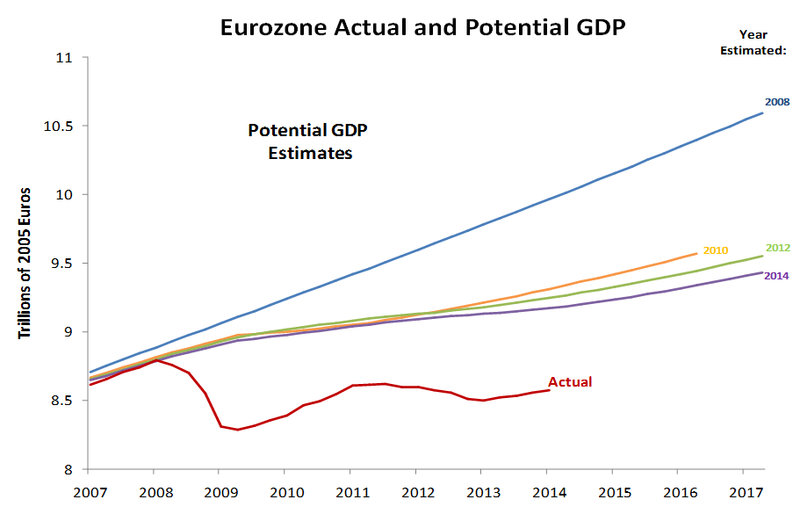 For the Eurozone, GDP is almost 15% below its 2008-estimated potential and potential output has been written down by almost 10%. As Figure 2 illustrates Europe’s output shortfall is almost identical to the one Japan experienced when the bursting of its ‘bubble economy’ triggered a financial crisis. 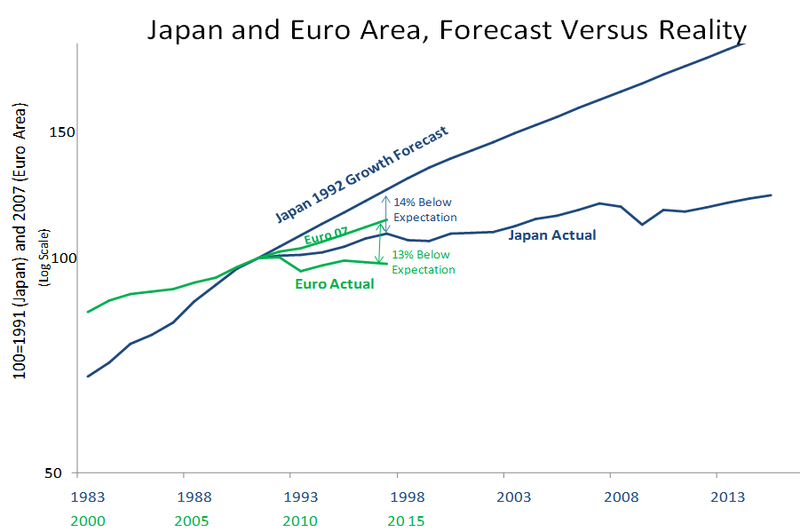 The experience of Japan in the 1990s and now that of Europe and the US suggests that – for the purpose of understanding and combating important fluctuations – theories that take the average level of output and employment over a long time period as given are close to useless. Unfortunately almost all work in both the New Classical and New Keynesian tradition has focused on the second moment (the variance) of output and employment. This thinking presumes that with or without policy intervention the workings of the market will eventually restore full employment and eliminate output gaps. The only questions go to the volatility of output and employment around their normal levels. What has happened in the last few years suggests that the second moment is second-order relative to the first moment – the average level of output and employment through time. The “new secular stagnation hypothesis” responds to recent experience and the manifest inadequacy of conventional formulations by raising the possibility that it may be impossible for an economy to achieve full employment, satisfactory growth and financial stability simultaneously simply through the operation of conventional monetary policy. It thus provides a possible explanation for the dismal pace of recovery in the industrial world and also for the emergence of financial stability problems as an increasingly salient concern. This column focuses on the idea of secular stagnation. After noting the apparent difficulty that industrial economies are having in achieving financially stable growth with full employment, I explain why a decline in the full employment real interest rate – FERIR, for short – coupled with low inflation could indefinitely prevent the attainment of full employment. I argue that even if it were possible for the FERIR to be attained, this might involve substantial financial instability. Having made the case that a decline in the FERIR would explain much of what we observe, I then adduce a variety of factors suggesting that the FERIR has declined substantially over the last several decades in the industrial world. I conclude by discussing the relationship between the secular stagnation and hysteresis, global aspects and policy implications. It has now been more than 5 years since the US economy reached its trough in the second quarter of 2009 and close to 5 years since evidence of systemic financial risk as reflected in LIBOR spreads or the need for government bailouts or elevated risk premiums on bank debt has been pervasive. Yet US economic growth has averaged only 2% over the last 5 years despite having started from highly depressed state. In a similar vein, credit spreads in Europe have come way down and fears of the dissolution of the Eurozone have been sidelined, yet growth has been glacial over the past several years and is not expected to rapidly accelerate. Upon reflection, these patterns should be surprising. If a financial crisis represents a kind of power failure one would expect growth to accelerate after its resolution as those who could not express demand because of a lack of credit were enabled to do so. Unfortunately it appears that the difficulty that has arisen in recent years in achieving adequate growth has been present for a long time but has been masked by unsustainable finances. Here it is instructive to consider the performance of the US and Eurozone economies prior to onset of financial crisis in 2007. Start with the United States. It is certainly fair to say that growth was adequate perhaps even good during the 2003-2007 period. It would not be right to say either that growth was spectacular or that the economy was overheating during this period. And yet this was the time of vast erosion of credit standards, the biggest housing bubble in a century, the emergence of substantial budget deficits and what many criticize as lax monetary and regulatory policies. Imagine that US credit standards had been maintained, that housing had not turned into a bubble and that fiscal and monetary policy had not been simulative. In all likelihood output growth would have been manifestly inadequate because of an insufficiency of demand. Prior to 2003, the economy was in the throes of the 2001 downturn and prior to that it was being driven by the internet and stock market bubbles of the late 1990s. So it has been close to 20 years since the American economy grew at a healthy pace supported by sustainable finance. Making judgments for Europe is more difficult because of the problem of evaluating structural constraints on growth. But in retrospect it is clear that much of the strength of the economies of the periphery prior to 2010 was based on the availability of inappropriately cheap credit and that much of the strength of the economies of Northern Europe was derived from exports that were financed in unsustainable ways. How might one understand why growth would remain anaemic absent major financial concerns? Suppose that a substantial shock took place – for reasons that I will describe subsequently – and that this tended to raise private saving propensities and reduce investment propensities. How would growth be affected? The normal answer to this question is that one would expect interest rates to fall (driven either by market forces or policy actions) until the saving and investment rate were equated at the full employment level of output. That is to say, changes in saving and investment propensities, or for that matter, in government deficits might be expected to impact an economy’s FERIR but not its level of output and employment. But this presupposes full flexibility of interest rates. In fact, in modern economies short term safe interest rates cannot fall appreciably below zero because of the possibility of currency substitution. 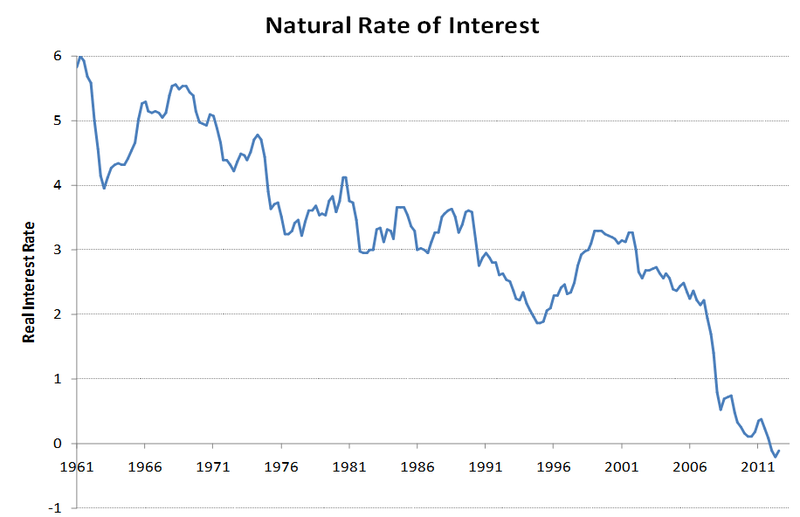 So interest rates are not fully flexible in modern economies. Note that interest rates that include term or credit premia will never fall to zero but only to a level that reflects these premia. Hence the possibility exists that no attainable interest rate will permit the balancing of saving and investment at full employment. This is the secular stagnation hypothesis first put forward by Alvin Hansen in the 1930s. Notice that as Keynes, Tobin and subsequently Brad Delong and I have emphasized, wage and price flexibility may well exacerbate the problem. The more flexible wages and prices are, the more they will be expected to fall during an output slowdown leading to an increase in real interest rates. Indeed there is the possibility of destabilizing deflation with falling prices leading to higher real interest rates leading to greater output shortfalls leading to more rapidly falling prices and onwards in a vicious cycle. Even if the zero interest rate constraint does not literally bind, there is the possibility that the positive interest rate consistent with full employment is not consistent with financial stability. Low nominal and real interest rates undermine financial stability in various ways. They increase risk taking as investors reach for yield, promote irresponsible lending as coupon obligations become very low and easy to meet, and make ponzi financial structures more attractive as interest rates look low relative to expected growth rates. So it is possible that even if interest rates are not constrained by the zero lower bound, efforts to lower them to the point where cyclical performance is satisfactory will give rise to financial stability problems. Something of this kind was surely at work during the 2003-2007 period. 2. What has happened to the FERIR? Slower population and possibly technological growth means a reduction in the demand for new capital goods to equip new or more productive workers. Throughout the industrial world levels of labor force growth are way down with labor force shrinkage already under way in Japan and soon to come in large parts of Europe. Lower priced capital goods means that a given level of saving can purchase much more capital than was previously the case. Information technology continues to decline rapidly in price and to account for a larger share of total capital investment. It is revealing that the iconic cutting edge companies have traditionally needed to go the market to support expansion. Today leading edge companies like Apple and Google are attacked for holding on to huge cash hoards. Rising inequality operates to raise the share of income going to those with a lower propensity to spend. Closely related a rising profit share operates to transfer income to those with a lower propensity to spend. Increasing friction in financial intermediation associated with greater risk aversion in the wake of the financial crisis and increased regulatory burdens operates to raise the wedge between safe liquid rates and rates charged to borrowers. In general equilibrium this drives down safe rates. The same effect is present if debt overhangs or increased uncertainty discourages borrowing. A rising desire on the part of central banks and governments to accumulate reserves coupled with conservative investment strategies operates to raise the demand for safe assets driving down safe interest rates. This effect is reinforced by requirements that encourage pension funds and insurance companies to hold their assets in safe bonds as to best match liabilities. Ongoing disinflation which means that at any given real interest rate, real after-tax interest rates are higher. To the extent that it is after-tax real interest rates that matter for investment decisions (as for example with tax deductible mortgages), this operates to shift investment demand inwards, resulting in a pretax real interest rate lower than it was before. The importance of these considerations is suggested by the available empirical evidence on actual real rates and on estimates of the FERIR. Figure 3 shows trends in indexed bond yields for a number of countries. It is clear that they have trended down over the last 15 years. Even more relevant for the US economists at the Fed, Laubach and Williams (2003) have attempted to estimate the FERIR – using data on actual real interest rates and measures of where the economy is relative to its potential. While many issues can be raised with respect to their calculations, Figure 4 illustrates their estimate of a substantial long term decline in the FERIR. 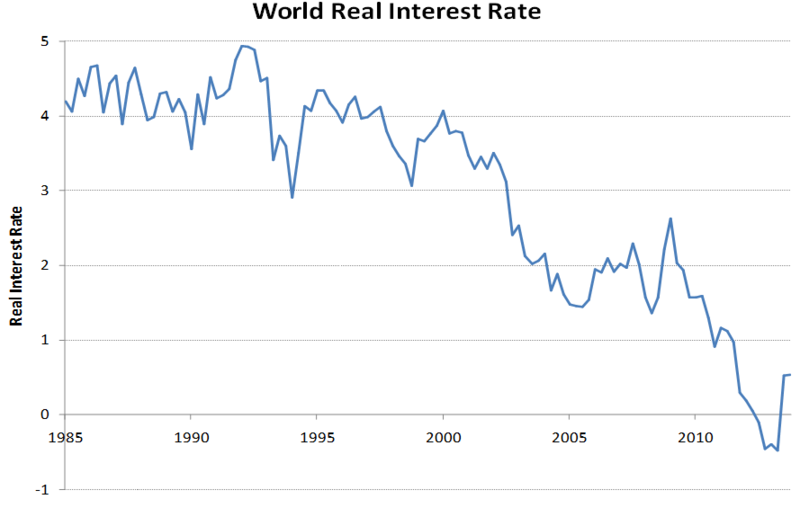 The IMF in its most recent World Economic Outlook has examined trends in real interest rates in industrial countries and has also considered a variety of factors bearing on real rates. They have reached conclusions similar to the ones I have reached here – that the FERIR has likely declined in recent years. This observation, together with the observation that lower US inflation – and in Europe declining rates of inflation – make it more difficult than previously to reduce real interest rates. This in turn suggests that the zero lower bound and secular stagnation are likely to be more important issues in the future than in the past. At a minimum the analysis suggests that if full employment is to be maintained in the years ahead, real interest rates in the industrial world will likely be lower than they have been historically – a development that may have important implications for financial stability. How great are the risks? Alvin Hansen proclaimed the risk of secular stagnation at the end of the 1930s only to see the economy boom during and after World War II. It is certainly possible that either some major exogenous event will occur that raises spending or lowers saving in a way that raises the FERIR in the industrial world and renders the concerns I have expressed irrelevant. Short of war, it is not obvious what such events might be. Moreover, most of the reasons adduced for falling FERIRs are likely to continue for at least the next decade. And there is no evidence that potential output forecasts are being increased even in countries like the US where there is some sign of growth acceleration. On their own, secular stagnation ideas do not explain the decline in potential output that has been a major feature of the experience throughout the industrial world. The available evidence though is that potential output has declined almost everywhere and in near lockstep with declines in actual output; see Ball (2014) for a summary. This suggests a way in which economies may equilibrate in the face of real rates above the FERIR. As hysteresis theories which emphasize the adverse effects of recessions on subsequent output predict, supply potential may eventually decline to the level of demand when enough investment is discouraged in physical capital, work effort and new product innovation. Perhaps Say’s dubious law has a more legitimate corollary – “Lack of Demand creates Lack of Supply”. In the long run, as the economy’s supply potential declines, the FERIR rises restoring equilibrium, albeit not a very good one. There is important work to be done elucidating the idea of secular stagnation in an open economy context. The best way to think about the analysis here is to treat it as referring the aggregate economy of the industrial world where – because of capital mobility – real interest rates tend to converge (though not immediately because of the possibility of expected movements in real exchange rates). If the FERIR for the industrialized economies were low enough one might expect capital outflows to emerging markets which would be associated with a declining real exchange rates for industrial countries, increased competitiveness and increased export demand. The difficulty is that this is something that emerging markets will accept only to a limited extent. Their response is likely to be either resistance to capital inflows or efforts to manage currency values to maintain competitiveness. In either case the result will be further downward pressure on interest rates in industrial countries. 4.What is to be done? Broadly to the extent that secular stagnation is a problem, there are two possible strategies for addressing its pernicious impacts. The first is to find ways to further reduce real interest rates. These might include operating with a higher inflation rate target so that a zero nominal rate corresponds to a lower real rate. Or it might include finding ways such as quantitative easing that operate to reduce credit or term premiums. These strategies have the difficulty of course that even if they increase the level of output, they are also likely to increase financial stability risks, which in turn may have output consequences. The alternative is to raise demand by increasing investment and reducing saving. This operates to raise the FERIR and so to promote financial stability as well as increased output and employment. How can this be accomplished? Appropriate strategies will vary from country to country and situation to situation. But they should include increased public investment, reduction in structural barriers to private investment and measures to promote business confidence, a commitment to maintain basic social protections so as to maintain spending power and measures to reduce inequality and so redistribute income towards those with a higher propensity to spend. Summers, Lawrence (2014). “U.S. Economic Prospects: Secular Stagnation, Hysteresis, and the Zero Lower Bound”, Business Economics, Vol. 49, No. 2, National Association for Business Economics. Laubach, Thomas and John C. Williams (2003). “Measuring the Natural Rate of Interest ”, Review of Economics and Statistics 85(4), 2003, pp 1063-1070.